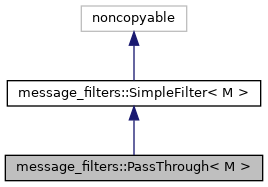 Simple passthrough filter. What comes in goes out immediately. Definition at line 48 of file pass_through.h. Definition at line 52 of file pass_through.h. Definition at line 51 of file pass_through.h. Definition at line 54 of file pass_through.h. Definition at line 59 of file pass_through.h. Definition at line 71 of file pass_through.h. Definition at line 76 of file pass_through.h. Definition at line 82 of file pass_through.h. Definition at line 65 of file pass_through.h. Definition at line 87 of file pass_through.h.